Quality of Life, the excellent feature film about two young writers in the San Francisco graf scene, is now out on DVD. It looks like there are lots of fun extra features, including a 38-minute making-of documentary, which I’m really looking forward to seeing, because this movie was made and funded in a very unusual way. Speaking of which: buying the DVD directly from the creators is the way to go. I just ordered my copy. 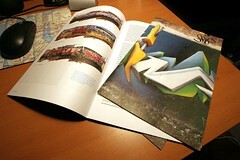 The latest issue of Font Magazine is all about graffiti. The cover is by Daim, and inside is a thoughtful and nicely presented article about graffiti from a typographer’s perspective. The article also features a few layers from Graffiti Archaeology, courtesy of yours truly. As far as I know it’s not available in stores, but you can order a free copy directly from the fine folks at FontShop. Check it out! Check this out: Baptiste Buonomo, an animation student from EMCA in Angoulême, France, has made an animated short about graffiti called Virus. 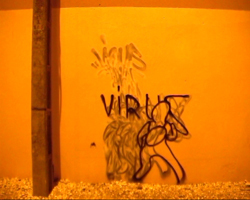 The fun starts with a live action shot of a kid in a hoodie tagging “virus” on an old plaster wall. The kid exits, and the tag grows, multiplies, and morphs into a simple cartoon version of him, which then starts running around the town’s walls making mischief. This may not sound like anything special, until you realize how it must have been done: it looks like every frame of animation was actually painted directly on the wall itself, in the middle of the night. This meant erasing the old frames before painting each new one, a technique also known as “painting under the camera”. You can see the ghosts left behind from earlier frames in the image above. It must have taken hours of work! If this is what it looks like, it may well be the first ever example of underground, unpermitted street animation. Whatever you call it, it took a lot of guts! Monsieur Buonomo, my hat is off to you. Click here to see the video (RealPlayer format). For another example of animated graffiti, see: Barnstormers Spread the Know.